TheBlueGuerilla: CF Exec Members Clamour for High Profile Meetings. CF Exec Members Clamour for High Profile Meetings. CONCERNS have been raised by activists over the "noticeable" divide in strategy between a member of the National Executive Committee and what appears to be other key players and the wider regional council. 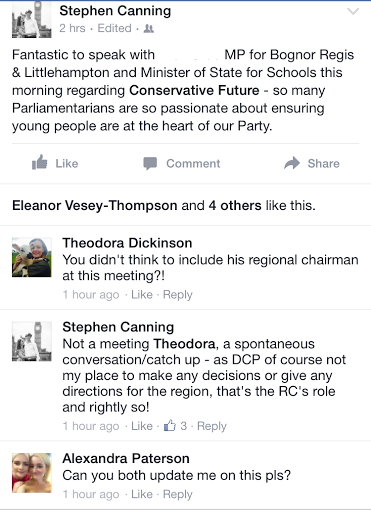 The online fiasco which has been edited, saw CF's Deputy Political Chairman talk of an exclusive meeting with a high profile Tory MP, causing some to raise eyebrows. One insider close to the Tory CF Exec commented: "It's important that people don't confuse genuine meetings with bumping into an MP in your place of work for 2 minutes - that's not really what one would call a meeting. This is getting a little bit silly." Why has the MPs name been blanked out when you've left the constituency name and ministerial title in?....Nick Gibb, not hard to tell.